To round out this week on Critical and Creative Coding, we offer code from a Facebook app called Rando by artist Ben Grosser (@grosser). Like his Demetricator, the piece is part of Grosser's larger project to disrupt Facebook's control of its users. Facebook’s “reactions” let you quickly express how you feel about a link, photo, or status. While such data might be helpful for your friends, these recorded feelings also enable increased surveillance, government profiling, more targeted advertising, and emotional manipulation. Go Rando is a web browser extension that obfuscates how you feel. 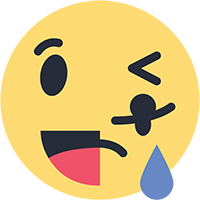 Every time you click “Like”, Go Rando randomly chooses one of the six Facebook “reactions” for you. Over time you'll appear to Facebook’s algorithms as someone whose feelings are perfectly balanced—as someone who feels Angry as much as Haha or Sad as much as Love. You can still choose a specific reaction if you want to, but even that choice will be obscured by an emotion profile increasingly filled with noise. In other words, Facebook won’t know if your reaction was genuine or not. Want to see what Facebook feels like when your emotions are obscured? Then Go Rando! Consider Rando in the context of the Week 2 theme. // @description Obfuscates your feelings on Facebook. // Thanks to my Beta Test Team!! // Thanks to Sebastian Frith for his Illustrator prowess! // excludes in the URL match, so we do it here. // triggers an obufscation rather than regular "Like"
-How does the code express Grosser's critical intervention? -How does this code affect the way we see Facebook? -In what ways does this code disrupt Facebook's functioning, serve or enhance it? - Where do you sense Grosser's play and irony in the code? Let's take something easy on the surface of the code, first. What do people make of the ASCII art of RANDO in the code itself. I know we've talked about this before, but what does it mean to put a depiction of the RANDO emoji (mult-emoji) into the code itself, how does that extend @grosser's subversion? How does the use of this 1980s art form, which has been reclaimed by retro artists, impact the way and what this code means? Of course, better can sometimes become the enemy of good. For example, lock mechanisms preventing human operators from entering an input error might also eliminate the possibility of fixing an unanticipated problem during a mission by going through the back door. On Apollo 14, for example, erroneous hardware signals were misleading the software, and it became necessary to manually intervene in real time to “fool” the software so that it would ignore the signals. The change, made at the eleventh hour by the developers working closely with the astronauts through Mission Control, would go against the software specification but would remain consistent with the original intent of the system requirements at large. Rando has to contend with quite a few more "lock mechanisms," however. We can't just re-key opcodes into Pinball. We have to rely on Google (/Mozilla/Apple) condoning extensions in the browsers, plus mediated "stores" to distribute them, key signatures, our trust that @grosser isn't malign, etc. And these "lock mechanisms" are distributed. Rando leads a very contingent life. It has to be less a program than a project, ready to change and adapt to the latest random changes to the FB page structure, to Google's extension API, to our expectations of privacy from @grosser, etc. What do people make of the ASCII art of RANDO in the code itself. I know we've talked about this before, but what does it mean to put a depiction of the RANDO emoji (mult-emoji) into the code itself, how does that extend @grosser's subversion? How does the use of this 1980s art form, which has been reclaimed by retro artists, impact the way and what this code means? Encoding the RANDO emoticon-logo (by simulating dot-matrix printing using unicode braille, no less) is an interesting gesture. It is both "very 1980s" in its BBS-aesthetic, and at the same time absolutely 21st-century in two ways. First, it presumes a pervasive unicode infrastructure to make those codes legible (rather than ASCII) -- it isn't ASCII art, because it isn't using ASCII characters. Second, it is a play on the concept of emoji as they relate to mobile devices, social media and web 2.0+. I also feel like this is referential in a way that only works in relation to the original high-rez image. After a lot of squinting I guessed that it was a lopsided face with a huge tear-drop, rather than the planet earth with Australia leaking off the edge. But I wasn't confident in my guess. I think that the closure required to get to actual image (which is itself a compilation of other images) is more than you could expect character encoded art to accomplish. It works to evoke its referent only if you already know it. A final note: part of the play here is surely that many mixed / ambiguous / multi-faces are not part of standard emoticon character sets: the point of the RANDO logo is that it is a missing or imagined character -- something that doesn't exist in the constrained icon set, the provided characters or vocabulary.